Bread Baking Babe Karen of Bake My Day choose us Buddies to bake a Peter Reinhart's recipe from his book "Artisan breads every day" (which is still on my wish list). After the dough is kneaded it has to sit in the fridge at least overnight, but anything up to four days, which makes this recipe ideal to fit into any routine. Special ingredients being wild rice and dried onions, I didn't have a clue where to get these around here. Luckily our local "Fruit and Nut Place" came to the rescue (again) and I did find a nice small packet of wild rice. I still don't know what dried onions look like, so I opted to use caramelized onions. After kneading the dough (in my bread maker) I left it in the fridge for two days. It definitely doubled in size in the cold! I shaped the cold dough into a batard and left it to rise in a banneton at room temperature for just over two hours. Put all ingredients (in the above order) in the bread maker and choose the "pizza dough" program. After 10 mins. leave the dough to rest for 10 mins. Then choose "pizza dough" program again for another 10 mins. of kneading. Transfer the dough into a slightly oiled container, cover and store in the fridge for up to four days. On baking day shape the cold dough and put it in a floured banneton. Leave the dough to rise -covered- for approximately two hours at room temperature. Meanwhile preheat oven to 200C (fan). Turn the risen dough out onto a baking sheet, spray the top with water and bake for 15 mins. Lower the oven temperature to 180C (fan) and bake for another 20 mins. (The inner temperature of the loaf was 94C by then.) Leave to cool on a wired rack. Your bread is gorgeous! The crumb, is, I think, characteristic of this bread, based on mine and the other pictures I've seen. The crumb makes it wonderful for sandwiches--we've loved it that way. 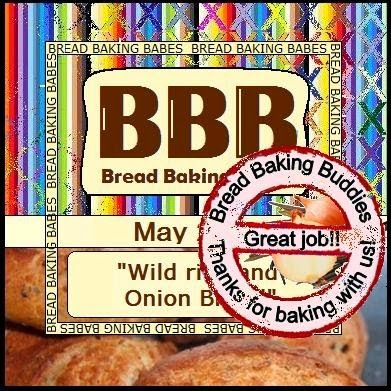 I congratulate you on a lovely bread, inside and out! Hope you will try again! Love that last shot with your black lab! What a fabulous photo of your very well behaved dog not even thinking of snatching a piece of bread! This bread is pretty dense in crumb, but good for toast and sandwiches. I used the mixer dough hook for most of my kneading and it was fine, but I was expecting a fairly dense bread. Yours looks really wonderful and your dog is a beauty!